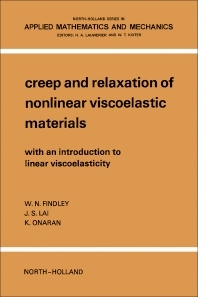 Creep and Relaxation of Nonlinear Viscoelastic Materials with an Introduction to Linear Viscoelasticity deals with nonlinear viscoelasticity, with emphasis on creep and stress relaxation. It explains the concepts of elastic, plastic, and viscoelastic behavior, along with creep, recovery, relaxation, and linearity. It also describes creep in a variety of viscoelastic materials, such as metals and plastics. Organized into 13 chapters, this volume begins with a historical background on creep, followed by discussions about strain and stress analysis, linear viscoelasticity, linear viscoelastic stress analysis, and oscillatory stress and strain. It methodically walks the reader through topics such as the multiple integral theory with simplifications to single integrals, incompressibility and linear compressibility, and the responses of viscoelastic materials to stress boundary conditions (creep), strain boundary conditions (relaxation), and mixed stress and strain boundary conditions (simultaneous creep and relaxation). The book also looks at the problem of the effect of temperature, especially variable temperature, on nonlinear creep, and describes methods for the characterization of kernel functions, stress analysis of nonlinear viscoelastic materials, and experimental techniques for creep and stress relaxation under combined stress. This book is a useful text for designers, students, and researchers.